Just to let you know, A+ is now the highest score, as I am discontinuing A *star* as the start shape does not show on all PC's or MAC's. She can control her pack, but not her heart ...'I wanted him to kiss me?wished he could smell the desire that I knew was pouring off me. You can't, Calla. This boy isn't the one for you. Calla Tor has always known her destiny: graduation, marriage and then a life leading her pack. But when she defies her masters' laws to save a human boy, she must choose. Is one boy worth losing everything? This book blew me away. I was hooked from the moment I started to read it, so much that I devoured within days. It had a dangerous and seductive pull on me, putting me in the world of NIGHTSHADE. The Novel in itself is something new, but I loved it nevertheless. It’s a new take on the Dark Romance Genre, branching out from the vampires to Werewolves and Wraiths. The chapters were just the right size, and the chapter page with moon; Loving it. I think the first chapter was the perfect way to start off with Shay and the Grisly, which leads me on to Shay. 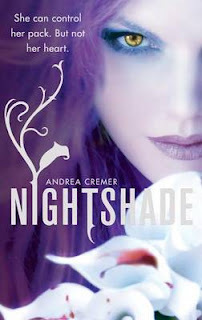 The book has a nice twist on the werewolves, and the world in which they live in; NIGHTSHADE is a hidden world, of passion, murder, lies, and werewolves. Cremer is Genius. It plays on the darker side of paranormal teen romance, which we haven’t quite seen yet. It explores some new creatures, which were very exciting. I love the way, it’s divided between Guardians, Keepers, and Searchers, and how you’re always on the edge not knowing who too trust or who the goody is. I mean, this plays a big part at the end with the Incident, with Calla, Shay, Bosque and the searchers. Calla is the main character, and the point of view that the book is set in. Basically, she is an Alpha, who is supposed to marry Reiner another Alpha, but she develops feeling for Shay and they run off together. She has a fierce character, and she very much hates the lower position of Women in her world. The idea is definitely unique, and Andrea Cremer has created a masterpiece. The writing is a pleasure to read, the world is enticing, I can NOT wait for Wolfsbane and I will love this Novel forever.